Real Madrid are set to take on Borussia Dortmund in the Champions League group game on Wednesday night, 06 December 2017 at Santiago Bernabue, Madrid. Real Madrid have already qualified for the knockout stages as group runnersup even if they beat Dortmund on Wednesday and Spurs lose their game against APOEL. The game will kickoff at around 20:45 CET / 19:45 uk time and BT Sports has the live coverage in the UK. This is how I expect both teams to lineup on Tuesday night, 26th September. Real Madrid are sure to start with trio of Ronaldo, Benzema and Bale upfront while Casemiro’s absence means Mateo Kovacic to start alongside Toni Kroos and Luka Modric. Dortmund however are not pushovers and their 6-0 win over Legia Warszawa might be the sign of things to come. Dortmund will be hoping to take inspiration from Wolfsburg’s 2-0 win over Real Madrid last season and get a position result. Pierre-Emerick Aubameyang is star play in Dortmund and he has been scoring goals for fun this season. 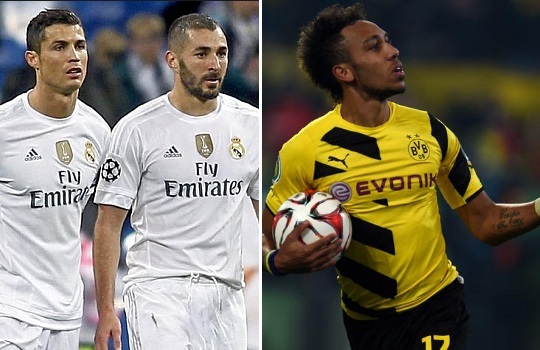 His pace and a packed midfield from Dortmund can cause all sorts of problems for Real Madrid. Last season of Champions League both of these sides were in same group and played out 2-2 draws in the group stages. 28′ 1 – 0 Karim Benzema tapped home from close range after Dani Carvajal put in a superb low cross. Madrid leads the group standings as the things stand. 53′ 2 – 0 Karim Benzema made it 2-0 just after the break and from than on it looked like a stroll in the park for Real Madrid. 61′ 2 – 1 Pierre-Emerick Aubameyang brought Dortmund back into he game with a nicely taken goal. Match Predictions: Hard to see Real Madrid getting anything out of this game specially after their recent draw in the hands of Las Palmas. Dortmund is a whole different level and Real Madrid has been struggling away from home for quite some time. Last season they got lucky to win the Champions League this year all other major European teams have strengthen their squads. I am going with a 2-1 win for Dortmund in this one. 17′ 0 – 1 Cristiano Ronaldo scored from close range after Benzema’s cut back to put Real Madrid in lead. He celebrates with Pepe and Fabio Coentrao in Real Madrid dug-out in front of Zidane. 68′ 1 – 2 Raphael Varane scores midway through second half to put Real Madrid back in the lead. 87′ 2 – 2 Andre Schuerrle scores late in second half to make it 2-2 on the night. Great stream. Dortmund V Madrid. Great work. Flawless.